Excellent location with a view of Mt. Otemanu. This property is not too far from the airport, located on its own island (motu). This hotel is kid-friendly, with an onsite mini-golf and other activities. The view from the restaurant over the fountains and pool on to the lagoon are unparalleled. A member of the Leading Accommodations of the World, the resort boasts authentic Polynesian style and architecture and certainly offers some of the most traditionally designed rooms and villas in Bora Bora. 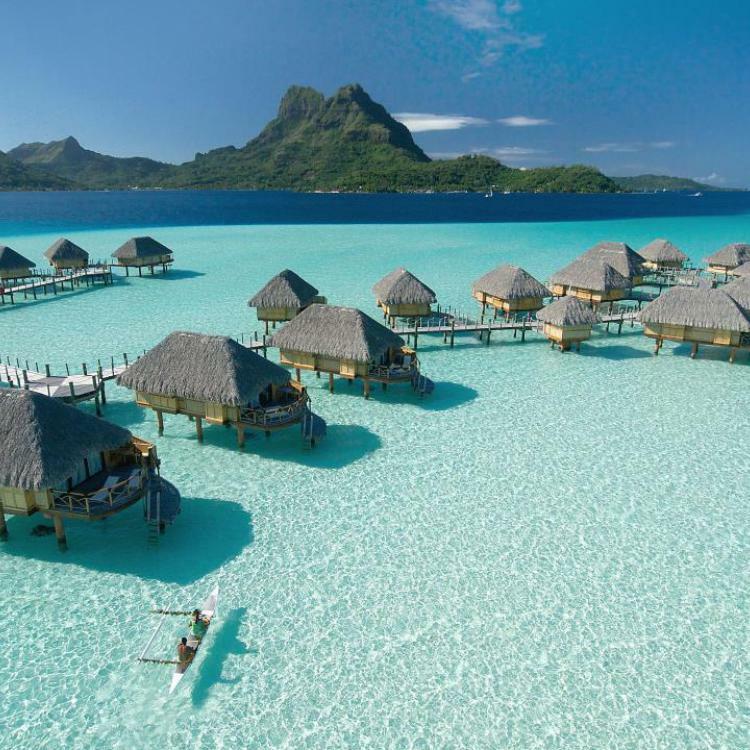 While overwater bungalows are Bora Bora’s iconic accommodation type, the resort also features spacious Garden Pool Villas and Beach Suites with jacuzzi and magical views of iconic Mount Otemanu. The eighty rooms and villas are nestled in a beautiful tropical garden, on the beach and of course above the turquoise lagoon. There are three restaurants and two bars, and cuisine is international with a Polynesian twist. At the TĀVAI Spa, the islands’ generous nature has been captured to create decadent treatments that will rejuvenate and renew. Vichy shower body scrubs, hot stone massage with fragrant ‘monoï’ oil, or the local ‘taurumi’ massage, there is a lot to choose from and spa lovers will not be disappointed. As far as recreation, a variety of non-motorized water toys are available: stand up paddle boards, kayaks and outrigger canoes, snorkeling equipment. On land: tennis court, mini golf, ping pong, pool table, volleyball, pétanque and a fully air-conditioned gym.